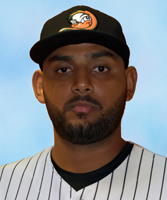 Burgos enters his first season on Long Island and 12th in professional baseball. The right-hander pitched with the Arizona Diamondbacks for two seasons at the MLB level (2015-16). He made 73 relief appearances, compiling a 3-4 record, three saves and 82 strikeouts over 68.1 innings pitched. The Panama native tossed a scoreless inning in his Major League debut on April 29, 2015, against the Colorado Rockies. Burgos also spent time in the Atlanta Braves organization, pitching with Triple-A Gwinnett in 2017. The 28-year-old split the 2018 season with Guerreros de Oaxaca and Pericos de Puebla in the Mexican League. He combined to go 2-1 with a 4.73 ERA in 16 games, striking out 14 batters over 13.1 innings. His best season came in 2014 with the Single-A Visalia Rawhide. He led the California League with 29 saves, ranked second with 55 appearances and turned in a 2.47 ERA with 83 strikeouts over 54.2 innings. For his efforts, he earned California League Mid-Season and Post-Season All-Star honors and was named an MiLB.com Organization All-Star. Burgos was originally signed by the Diamondbacks as an amateur free agent in 2008.